As diplomatic humiliations go, Hassan Rouhani's refusal to accept President Obama's offer of an informal "encounter" and historic photo-op at Tuesday's meeting of the U.N. General Assembly may not be the most consequential. But it is among the most telling. This isn't the first time an Iranian president has left his U.S. counterpart cooling his heels at Turtle Bay. In 2000, Bill Clinton sought a meeting at a U.N. luncheon with then-Iranian president Mohammed Khatami, another reputed moderate, who also declined the opportunity of an American handshake. Back then, the explanation for Mr. Khatami's refusal was that internal Iranian politics would not have allowed it. On Tuesday, a senior Obama Administration official peddled a similar line after the Rouhani snub, telling reporters that Iranians "have an internal dynamic that they have to manage." That's one way of putting it. Another way is that Iran's ruling clerics and Revolutionary Guard Corps remain ideologically incapable of reconciling themselves to the Great Satan. This shouldn't surprise anyone who reviews the 34-year-history of Iranian rebuffs to American diplomatic overtures, which makes the U.S. embarrassment on Tuesday all the more acute. For days before the U.N. conclave, White House aides had broadcast the President's desire to shake Mr. Rouhani's hand. By Monday, the press was overflowing with leaked accounts of where and how it would happen. Having thus turned down the lights and turned up the mood music, it made the snub that followed especially potent. What the Administration is trying to spin as a function of complex Iranian politics was, in blunt fact, an expression of lordly contempt for what Iranian leaders consider to be an overeager suitor from an unworthy nation. 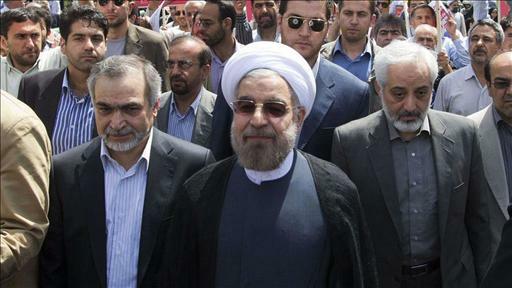 The contempt showed even more strongly in Mr. Rouhani's speech. That came a few hours after Mr. Obama's morning speech, in which the American promised Iran that "we are not seeking regime change, and we respect the right of the Iranian people to access peaceful nuclear energy." To that olive branch, Mr. Rouhani responded by denouncing international sanctions as "violence, pure and simple," warning against the influence of "warmongering pressure groups" (no mystery as to who he has in mind there), and offering "time-bound" negotiations to resolve the nuclear issue. As Israeli ambassador to the U.S. Michael Oren has pointed out, the offer that talks should be "time-bound" makes no sense if Iran is sincere about never developing nuclear weapons. But Iran's record over three decades is that it is not sincere. In his speech, Mr. Obama reiterated that "we will not tolerate the development or use of weapons of mass destruction." It could not have been lost on the Iranians that Mr. Obama is in the process of tolerating exactly that in Syria. Mr. Obama also said that it is "in the security interest of the United States and the world to meaningfully enforce a prohibition" against the use of chemical weapons. But the lack of meaningful enforcement has been the President's policy for nearly a year. Politics in the normal sense doesn't exist in Tehran, where the rules are set and the players chosen by Supreme Leader Ayatollah Khamenei, who is accountable to nobody. What Iran's leaders do understand is how to humiliate adversaries they consider to be weak. We hope Mr. Obama appreciates how he has been schooled.